We have thoroughly enjoyed our stay at Misty Mountain. It was a perfect place for our getaway. Our 6 & 4 year olds loved the Polar Express, but also loved just playing around the cabin. We loved the deck and the view and will leave refreshed. Very easy and professional. Wish I could stay longer. Comfortable and pleasant stay. Loved the seclusion of the cabin at the same time the proximity to downtown Bryson City. From the moment we stepped in the door it was paradise. So many things in this cabin blew me away. Like the bathroom floor heating up at the touch of the button, the amazing bed, the appliances ETC...../ We cam her for a mini vacation and so far so good. This is only our second day and already I don't want it to end. It has been so relaxing and romantic and has been an amazing place to share with the love of my life. Excellent customer service! Communication was great. We enjoyed our stay. The cabin was clean and well stocked with towels, linens, kitchen utensils/dishes etc. Outdoor area was beautiful as well. Gas grill, charcoal grill, and fire pit create a nice area to enjoy the outdoors. Hassle free booking and quality of customer support are excellent! Our first trip to Bryson and we couldn't have picked a better cabin! Beautiful dcor, amazing views and so comfortable! Thank you for making our trip so enjoyable. Can't wait to come back. Wonderful Time at your cabin! Would love to stay again maybe longer next time. The view was beautiful, cabin was spacious, and love all of the bears. The grandkids would have loved to see real ones though. Thank you for sharing you little piece of heaven!!. Anytime I emailed or called GSCR, someone (I remember either Melissa or Kelli) responded very efficiently. Right after we checked in, I received a phone call to ensure we arrived safely and everything was okay with the cabin. Your team was very professional in handling the booking and arrival of our stay. After several days and hours of searching many other rental companies, we chose GSCR after I found Eagles Ridge Cabin..simply put! We preferred four bedrooms with four double or greater-sized beds (since it was seven of us staying). Not many other cabin options, while affordable too, offered this option. We also preferred an open den area with great mountain views, a wood fireplace, large dining table, and at least three bathrooms. And, we wanted ALL of this for only a two-night stay. Unfortunately, many other cabin rental companies who offered the above required a minimum three-night stay. Once I found Eagles Ridge Cabin, I stopped looking and immediately booked. I spoke with Cathie prior to making a reservation. She was very helpful and knowledgeable. She sent us a few different cabin options and helped me narrow it down. She provided excellent customer service! We loved our cabin! We had 4 kids with us and the cabin layout was perfect for that. The cabin was very nice and clean. It felt like a home away from home. I wish we could have stayed longer! 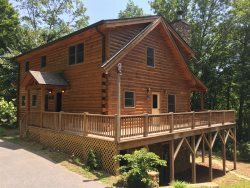 When we searched for properties online, Great Smoky Cabin Rentals responded quickly and was the most helpful. Staff was friendly and helpful. Enjoyed our stay once again at this beautiful cabin. Love the secluded feel and the mountain views. Will definitely stay here again. Stayed previously and was very pleased, wouldn't stay anywhere else in the area. Every time I called the person I spoke with was so helpful. Above and beyond. I've stayed in cabins around the smokies every year for a long time and I would highly recommend your cabins for anyone. This cabin was very romantic, comfortable and we so enjoyed staying. Loved the shower ...it was so big! The hot tub was great and the bed was so comfortable...all the special amenities just topped it off. Thank you. Very Pleasant experience! Kathy was exceptional and very accommodating! The directions to the property was right on! No problems getting there what so ever. The property was amazing and a perfect spot to build a cabin on! The view was exquisite and wanted for nothing. We had a wonderful weekend and will be back!!!! Thank you so much! We chose this cabin because it had everything we were looking for.... great view,hot tub,fire pit and a cabin feel..... BINGO... no need to look any further! Thank you for opening your beautiful home to my awesome friends/family. I am not exactly sure how you managed to create and stock this perfect cabin but thank you. I instantly felt at home and at peace here. You must be some amazing people to have been able to create such a haven for others to come and rest. Thank you. We had such a lovely weekend! The children enjoyed their first time here and their ride on the Polar Express! Wonderful memories Thanks so much! The view was beautiful. We had a great weekend here. My husband talked with someone over the phone and they were knowledgeable and polite. The property and nearby area is very nice and relaxing. Every needed amenity was available. The large windows that let in the sunlight were a nice feature. The outdoor amenities were nice as well. Thank you for sharing your wonderful cabin. The place is really wonderful. All the small amenities really added to the cabin. Loved the Shower. I must saw the views, peace and quiet, and the romantic feel of the cabin was the right combination. We had a great time.